The Burn Amarr campaign has concluded. From downtime on the 19th of June to that of the 22nd, forces belonging to the Imperium attempted to suicide gank freighters and haulers across the space lanes of the Domain region, in and around the Amarr system. The systems affected were Bhizheba, Sarum Prime, Ashab, Madirmilire and Niarja, as well as Amarr itself. During the 72 hour period, roving fleets of Catalyst class destroyers laid waste to one of the most important trade hubs in New Eden, second only to Jita and supplying the South and South East of New Eden. Now with the event finished its time to take stock, mull over the figures and ask whether it managed to achieve what it set out to? As previously stated, these figures are not complete because of the usage of alts and the fact that not all kills are recorded. However, they are accurate enough for the purposes of this article. From the looks of it, Imperium forces managed to inflict 360.994 Bil ISK damage in the 3 day period of time, while sustaining approximately 32.141 Bil ISK of losses, mainly in the form of Catalyst destroyers. Bhizheba was the least lucrative, offering only a couple of ganks at the start of the campaign, and was thus quickly abandoned, yielding only 3.09 Bil ISK damage. Niarja was the most deadly, with 152.24 Bil ISK destroyed during the length of the campaign. While Amarr system did rank 3rd in the contribution to the campaign, it was easily overshadowed by Niarja, which saw 3 times the action. Niarja is a choke point between Jita and Amarr, much like Uedama is between Jita and Dodixie/Hek/Rens. Statistics, excel sheets and figures are all nice, but meaningless without interpretation. Looking at killboards can tell you that a fight did happen, that someone apparently lost or won, but without an After Action Report, you can’t understand what transpired, why it did, and what was the true outcome. The same can be said for the Burn Amarr campaign. All the tables and numbers do little to explain the simple fact: The Imperium failed. The previous events held under the name Burn Jita had a massive ripple-effect. They saw the destruction of many assets, the locking down of an entire trading hub, and the flexing of CFC muscle (now referred to as the Imperium). They were a statement of power which even managed to catch the attention of CCP developers. However, the latest iteration didn’t measure up to it’s predecessors. While in previous Burn Jita events the Imperium managed to reach more than half a Trillion ISK in damages, this time it only reached 360 Bil. Not only that, but the Amarr system itself not only saw the least devastation, ranked only third in the damage sustained, but Imperium forces did not manage to lock it down. Reports of failed ganks, freighters running back and forth unmolested and even some clearly taunting Imperium forces, abounded. This, added to the general apathy that both the EVE community and the Imperium forces had shown towards the event, with sources within the Imperium claiming lack of participation, hardship getting enough members to fleet and even that most GoonSwarm Federation [CONDI] representatives were in fact, members of KarmaFleet, the newbie friendly corporation in [CONDI]. Now not all of these claims have been sufficiently collaborated, but they do add to give a very grim picture of the event. The event itself took place not in the center of New Eden, as Jita can be viewed, but in a secondary trade hub, mostly used as a drop off point by the alliances that inhabit the South and South East of New Eden. The number of concurrent pilots in the Amarr system rarely ever goes beyond 1100, only half of that of Jita at peak hours. Another factor is the timing of the event. While other Burn Jita were mostly kept around the month of April, this event was executed near the end of June. With summer vacation coming up for many people, EVE Online usually sees a decrease in activity around this period of time. Thirdly, with most of Null Sec entities waiting for the new sovereignty mechanics changes, dubbed as FozzieSov, there has been a notable indifference presented by many players, as everyone is waiting for the changes to be implemented. (1:17:53 PM) directorbot: With Burn Amarr reaching its ‘official*’ conclusion, we present to you these dutifully delicious preliminary results. These are preliminary results, and we expect them to be slightly low. But, with a combined damage of 771.87 billion ISK destroyed, we can say that we are extremely confident and happy with the sheer destructive power of the Imperium and its friends. UNOFFICIAL VICTORY LAPS – some FCs may be popping by after our ‘official’ close to run casual, fun ganks (on very unsuspecting targets!) – if you would like to join, look out for pings. If you would like to pack it in, please ensure that you contract your remaining Catalysts to DJ Warr, or log in NOW and trade to Etriza. As you can see, Imperium forces took credit for CODE. [CODE.] work in Uedama. Now the two groups have cooperated before, and accusations have been thrown at [CODE.] for being nothing more the an Imperium puppet (no proof was ever substantiated) but they operate independently of each other. [CODE.] has made Uedama its hunting ground for a while, only a few days before the Burn Amarr campaign going on a 24h killing spree in the system. it is more than likely that [CODE.] simply sought to use the Burn Amarr event to its advantage and catch the increased freighter and hauler traffic as pilots attempted to avoid the Domain region. Regardless, even if it was orchestrated by the Imperium, Uedema is an irrelevancy, since the system resides in the Citadel region of Caldari space, and the event after all, was called Burn Amarr, not Burn Domain, and certainly not Burn Domain AND the Citadel. While I call the Burn Amarr event a failure, I do not deem it a total loss. In its way, the event helped to highlight some of the problems plaguing the Imperium. The fact of the matter is, many in the so-called Imperium either resent their re-brand or care little for it. Their lack of participation was a show of no confidence in their leadership. The propaganda machine inflating numbers and claimed undue credit, a clear sign of the Imperium leadership noticing this worrying trend. It also shed some light on the deeper issues the Imperium has; specifically the tensions between alliances and the inherent indifference much of its pilots exhibit nowadays. Is the Imperium merely the CFC gasping its final breath? The answer to that will be a 100% genuine NO. I don’t believe these are the death throes of the greatest super power in New Eden. What I do believe is, that this is part of a worrying trend, that if not diagnosed and treated early, may lead there eventually. 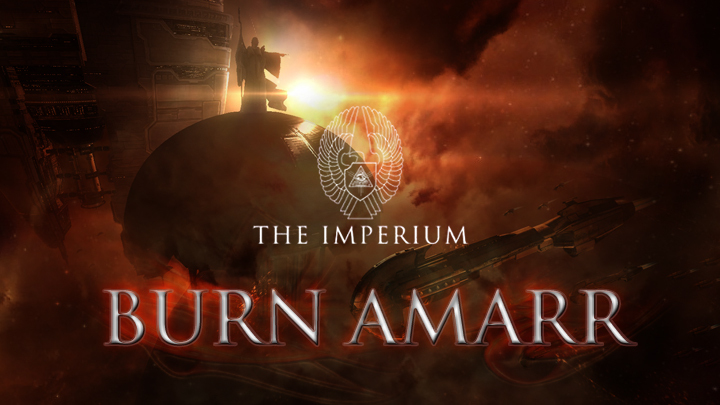 Whether it is a year or two from now, it seems inevitable that the Imperium will fall apart, unless its leadership is willing to look at the Burn Amarr failings as a warning sign. Only time will tell. Feel free to discuss in the comments section below whether I am right or wrong in my analysis, supply your own figures\evidence\analysis and debate the conclusions. Salivan Harddin writes for The EVE Scribe, Providence Bloc’s News Portal. When he isn’t busy writing articles, he usually jumps into wormhole fights, only to get stuck on the other side of the universe. Nice post. I learn something new and challenging on websites I stumbleupon every day. It’s always exciting to read through articles from other writers and practice something from other web sites. Have you ever thought about adding a little bit more than just your articles? I mean, what you say is important and all. However just imagine if you added some great images or videos to give your posts more, “pop”! Your content is excellent but with pics and video clips, this site could undeniably be one of the most beneficial in its niche. Terrific blog! I wanted to send a quick message in order to thank you for these fabulous secrets you are placing on this website. My considerable internet look up has at the end of the day been rewarded with professional facts to go over with my relatives. I would repeat that many of us website visitors are very blessed to live in a perfect site with so many marvellous individuals with good tricks. I feel very much grateful to have encountered your entire web site and look forward to really more awesome moments reading here. Thanks once more for everything. My developer is trying to persuade me to move to .net from PHP. I have always disliked the idea because of the expenses. But he’s tryiong none the less. I’ve been using Movable-type on various websites for about a year and am nervous about switching to another platform. I have heard excellent things about blogengine.net. Is there a way I can transfer all my wordpress posts into it? Any kind of help would be really appreciated! I am delighted that I noticed this web site, exactly the right info that I was looking for! . Needed to post you one tiny observation to help give many thanks yet again with the exceptional information you have discussed in this case. This has been so remarkably generous of you to supply openly all that some people might have made available as an e book to earn some profit on their own, primarily given that you might have tried it in case you considered necessary. The tricks also served to become good way to recognize that some people have the same fervor the same as my very own to grasp many more in regard to this issue. I’m sure there are millions of more pleasant times up front for individuals who find out your blog. I am glad to be a visitant of this gross website! , thankyou for this rare information! . I was very happy to search out this web-site.I wished to thanks on your time for this glorious learn!! I definitely enjoying every little bit of it and I have you bookmarked to check out new stuff you blog post. I have to express thanks to the writer for rescuing me from this particular incident. After surfing throughout the internet and coming across suggestions which are not beneficial, I was thinking my life was over. Being alive minus the strategies to the problems you have solved all through this article is a critical case, as well as the kind which might have in a wrong way affected my career if I had not come across your web blog. Your own mastery and kindness in taking care of everything was very helpful. I am not sure what I would have done if I had not come upon such a subject like this. I can now look forward to my future. Thanks for your time very much for the skilled and results-oriented guide. I won’t be reluctant to suggest the sites to anyone who ought to have guidelines on this situation. It¡¦s truly a nice and useful piece of info. I am happy that you simply shared this helpful info with us. Please stay us informed like this. Thank you for sharing. It’s really a nice and useful piece of information. I am satisfied that you shared this useful information with us. Please keep us informed like this. Thanks for sharing. Hello There. I found your blog the usage of msn. This is an extremely well written article. I will make sure to bookmark it and return to read more of your useful info. Thank you for the post. I’ll definitely return.